Entry doors are always a major part of curb appeal, and Therma-Tru has consistently been working on new ways to give homeowners, builders, and remodelers alike a better looking door while also taking into consideration quality and energy efficiency. Therma-Tru’s new Craftsman Sidelites offer yet another attractive option to dress up your entry door. Available in their Classic-Craft American Style and Canvas door collections, Therma-Tru Craftsman Sidelites come with nine glass options, including low-E, privacy, and decorative options. These sidelites are Energy Star rated, so not only do they complement Craftsman style entryways (hence their name) but also help save you energy, and money, in the long run. This is one of several product announcements Therma-Tru has made this past year. See what we had to say about their vented sidelites, privacy glass options, and their new Fiber-Classic Mahogany 3-panel door. Andersen has just released the 45-Minute Rapid Install System for storm doors, making their two most popular doors the fastest and easiest storm doors to install on the market. All it takes to install is basic tools and about 45 minutes, with no cutting and virtually no measuring involved. Your storm door comes pre-assembled and ready to install. Just set the pre-assembled door in your opening and attach it to your house. The hardware installs easily with a simple twist and lock handle-set and an innovative 2-piece closer bracket design with built-in spacers allows for easy installation as well as reliability. This new system is now available on the popular Contemporary Series Interchangeable Fullview and Contemporary Series Single Vent. There are eight color options and several glass options available. You also have a choice of nickel, brass, or oil-rubbed bronze handle options. With Andersen Rapid Install storm doors, adding beauty and energy savings to your entryway just got much easier. Learn more about the Andersen 45-Minute Rapid Install System. Click here for a PDF of the Andersen Rapid Install Storm & Screen Doors flyer. 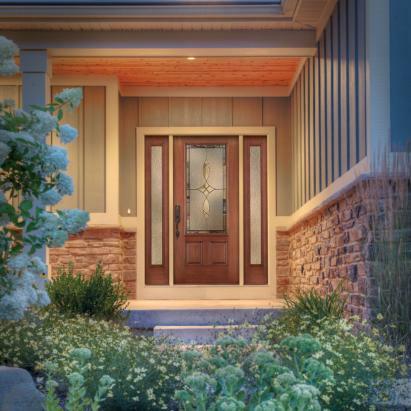 With the trend towards darker, richer wood tones in home interiors, Therma-Tru is now offering a collection of doors that offers the warm look of mahogany along with the durability of their fiberglass entry door systems. The new Fiber-Classic® Mahogany Collection™ offers “timeless” styles and a rich mahogany grain, allowing homeowners to extend a dark and rich wood tone from their interiors to their exterior entrances, creating a cohesive look throughout their homes. For more information about Therma-Tru doors, visit www.national-lumber.com/thermatru. New in 2012, Therma-Tru now offers four privacy glass designs: Chord, Chinchilla, Rainglass and Granite. This new feature helps you to maintain maximum privacy while still letting natural light into the home. Their triple-pane glass construction offers reduced outside noise and increased energy efficiency with an ENERGY STAR® qualified rating. Therma-Tru’s latest entry door innovation is affordable and is offered in 26 unique sizes to fit doors and sidelites in every one of Therma-Tru’s door collections. Privacy glass is also available in Impact-rated options, and also with external lite dividers for select door styles. To learn more about Therma-Tru doors, visit the Therma-Tru doors section of our eShowroom.